WordPress announced today that beta testing for the WordPress for BlackBerry app is complete and version 1.0 is now available in BlackBerry App World. WordPress for BlackBerry 1.0 has been in beta for more than six months, but version 1.0 adds support for VideoPress, improved commentening, and a spot in BlackBerry App World. What can you do with the WordPress for BlackBerry app? WordPress for BlackBerry is pretty awesome if you want to blog while you are on the move. The app allows you to write posts, edit pages, manage comments, and upload photos and videos. Although I don’t have a lot of time to blog, I really like the idea of having an app on my BlackBerry that will allow me to blog whenever I have the urge. 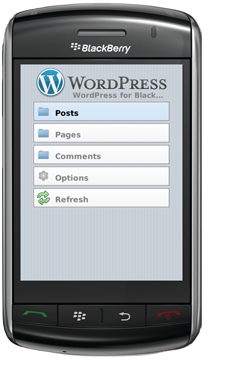 I went ahead and installed WordPress for Blackberry on my Tour and it works like a charm. I’m not sure how often I will use the app to create a new blog post or edit existing pages, but it’s nice to know that there is a feature that will allow me to do it. I really like the fact, however, that I can approve, delete, or put a hold on new comments because that is always an annoying task. If you are new to WordPress for BlackBerry I suggest that you give it a try. One thing I should mention before launching the app on your BlackBerry. If you have not given WordPress permission for remote publishing you will need to login to your WordPress blog and navigate to Settings –> Writing. Under the heading “Remote Publishing,” you will need to place a tick mark next to “Enable the WordPress, Movable Type, MetaWeblog and Blogger XML-RPC publishing protocols” in order to post to WordPress remotely. •	Ability to record and upload videos from your BlackBerry. •	Introducing support for the HD video service VideoPress. •	Support both 3gp and 3g2 formats on older generation BlackBerry devices.